It’s been over 11 years since I walked into the Wherehouse and sold almost all of my rap CDs. Looking like a crackhead–no offense–I went in there all shaky asking, “How much can I get for these?” I’m sure the cashier thought I stole them. Why else would a young black man come into a store and hawk all of his own rap CDs? Besides, a lot of them were pretty new. In the bag, there were the latest Tupac, Biggie, Bad Boys, and DMX albums. “Flesh of My Flesh and Blood of My Blood” had to be almost brand new. This was March and the album just came out in December. Anyone would assume that I was tripping off of something and they would have been right. It just wasn’t what they might have thought it was. I was tripping off of God. About a week before, I had an experience that had crushed my whole set of beliefs about God and Life. It left me so sensitive, that it was like the skin had been stripped from my entire body. All my senses were amplified and I was trying to do everything I could to not let anything get to me that created any kind of conflict, because it just hurt too much. It was as if I was racked with open wounds and the atmosphere was a mist of rubbing alcohol. Everything stung. In some ways it felt like a hyper active sense of being. I knew that in different circumstances it could have been awesome, but I was begging God to make it stop. I couldn’t take it. I knew that there was no way I was going to be able to go back to the life I had been living for the last three months. God stopped that on our road trip and he used DMX to do it. Christmas was the last time I had seen my soon to be ex-wife. Like many young couples, we signed on for something we weren’t ready for. I know we loved each other, but we didn’t know how to communicate it. What can you do? We had been arguing a lot and I didn’t know how to handle it. I don’t like fighting as it is, but I especially don’t like fighting over things that I can’t do anything about. I was getting tired and lately I was starting to feel tempted to do some things that weren’t really what I wanted to do. You know how if you get accused of something long enough you start feeling like you might as well do it? That’s the space I was in. I was praying to God for strength, but it seemed like I was just getting weaker. I started putting myself in compromising situations and I knew it was only a matter of time before I crossed the line. So I did the only thing I could think of at the time–I volunteered to go to Desert Storm. A lot of you don’t know this, but it was still going on in 1999. I got my orders and I told my wife the truth. I am not the smoothest dude in the world. I will never be accused of that. I just gave the situation what I had. I told her that I was fighting temptation and that I could not argue anymore. I was going to the Middle East where there was no alcohol allowed and almost no women and that I was going to take my Bible and pray like crazy and when I got back we were going to work on our marriage. I had it all figured out, but God had other plans. Long story short–I sent her to Michigan to be with her family while I was in Saudi, but when I got back to Arizona, my orders got canceled. I was told that I would be leaving a week or two later. That never happened. I guess my wife thought I made the whole thing up to get her to leave and I was too tired to explain otherwise. I prayed that God would clear things up with us, but when it became obvious that it wasn’t happening, I got pissed. The way I felt at the time was that I had spent so many years trying to be a good guy and all I got out of it was strife. I went through the same ish as the dudes that did the real ill stuff. On top of that, I didn’t really know anyone that I could relate too. I decided to just become what I was accused of. I thought about all the BS I encountered in my life. I thought about how as a black man I had to deal with all the racial crap and how I didn’t let it stick. I thought about how it sucked not to grow up with my dad and how I pieced together a father figure out of summer visits, my uncles, old cats that were nice to me, my barbers, other people’s dads, and Cliff Huxtable. I thought about how I tried to keep to myself, but yet all through school people wanted to fight me for no good reason. I thought about girls who called me gay for respecting them. It is dark and hell is hot was right. Anger was rushing in in a whole new way. All of sudden the way I heard my music changed. Rather than hearing it at a distance like a witness, it became personal. I saw the truth in the world that they were angry with. I was angry with it too. I was angry with women, people, the world, but more than that I was angry with God. I was done listening to [Him] or so I thought. 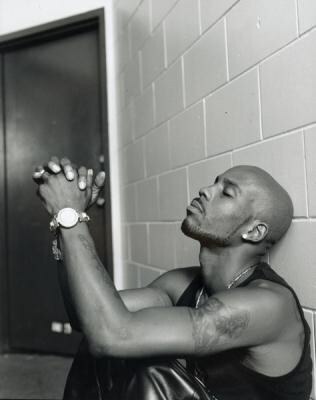 For the next few months I surrendered to my anger and no one expressed my anger better than DMX. I couldn’t get the Ruff Ryder’s Anthem out of my head and I started hitting the clubs like I never had before. Since I was in AZ, I thought I would run into DMX one day. I heard he was around Phoenix sometimes and I imagined that if we talked we’d find that we had a whole lot in common. Like Tupac, I knew that there was more to his music than met the eye, but the difference with X was the Spiritual frustration I heard is in his lyrics. That’s what I was going through. Pac was a headtrip. He was going back and forth with this world trying to figure out how he could fix it for the people he felt like he belonged to. DMX didn’t belong to anyone’s world. He seemed like an archangel that woke up on the Earth and was like “What the f***”? Who spiked my milk and honey and dumped me here?” He sounded like a person that wanted to make people feel uncomfortable with the fakeness. He was showing people that he had the keys to the kingdom of his mind and could go from hell to heaven as he d*** well pleased and the only one that could stop him was God. So when people felt like they could make him do what he didn’t want to do or try to talk him into stuff he was angry. That’s what I felt from his music or maybe I was just projecting cause that’s how I felt. I was just standing on the other end of the spectrum. Whether he would agree or not didn’t matter. It was real to me at the time and that’s what I had to go on. I pretty much was battling mental demons for three months. I was doubting whether I even believed in God anymore. I guess that was my way of punishing God for not fixing my marriage. At any rate, it was pretty clear we were done for so I went to Michigan to pick up my car from her and drive back. It was a pretty nice Accord so I had intentions of getting back to AZ and profiling. Since I was going to be single again I figured what the heck. After a few days in MI, I knew there was no point in looking back. Even if a part of me wanted to fix our relationship, I was too ignorant at the time to actually do anything about it. In my mind I was feeling some insane kind of relief. Not having the pressure of trying to be a good guy anymore felt great. Not having God and Bible verses in my ear felt better. As long I was still “technically married”, I was avoiding getting caught up with any females who might get in the way if things turned around with my wife. But now that I knew that was done, I began hashing out my plans. My intention was to get revenge on women for all the times I called myself treating them right only to get hated on. I started thinking that maybe these songs were more than just entertainment. They were a warning not to get caught up. All of a sudden I saw all of the times that seemingly miraculous things happened in my life. I saw all the times that I had been blessed often without even asking for it. I saw that the hard times I was crying about were just a backdrop for me to see God’s Glory. He showed me very clearly that the only darkness in my life was the shadow I was casting, when I put myself ahead of the Light of His Love. It was a magnificent vision that encompassed my entire life in a matter of seconds while I was still driving. I knew for certain that I was never alone. God was with me my entire life and in that awesome moment when it seemed like I was receiving the greatest blessing of all, I felt like I could care less. My response to it was, “Leave me alone. I don’t believe in You anymore.” His clever response was, “If you don’t believe in Me, who are you angry with?” Oh snap! I couldn’t argue with that logic, so I turned the music up louder and tried to follow along. Yes. I am at @noroof. I’m on blog hiatus right now, but I will be back when I’m feeling it again.